I read everything I can get my hands on. Friend requests are welcome, but preferably from people with a compatible taste in books. Martyn V. Halm lives in Amsterdam, with his two children, one cat, two rats, and countless imaginary characters vying for attention. To ask Martyn V. Halm questions, please sign up. Martyn V. Halm Don’t write a book. Draft a story. Commit your story to paper or hard drive and pay no attention to the rules a book has to follow. When you’re…moreDon’t write a book. Draft a story. Commit your story to paper or hard drive and pay no attention to the rules a book has to follow. When you’re finished telling your story, you have a rough draft. The draft needs to be edited to be readable to outsiders. Get a good book on self-editing for fiction writers and follow the advice in how to improve your draft until it becomes a manuscript. Find people who are willing to read your manuscript and tell you where the story fails to engage them, so you can improve the manuscript until it’s worthy of publication. I noticed Katla never uses a firearm to kill her targets. Why is that? Aren't firearms the preferred tools for assassins? Martyn V. Halm You're not the first to ask this. 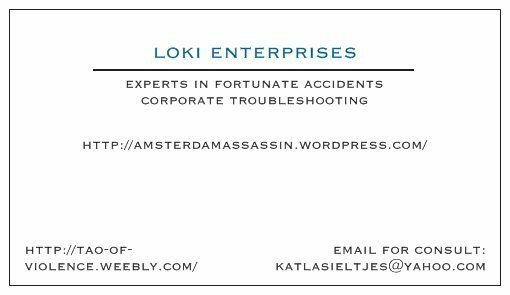 I received some questions concerning Katla’s preference or inclination toward using sharp implements over firearms.…moreYou're not the first to ask this. I received some questions concerning Katla’s preference or inclination toward using sharp implements over firearms. Many readers cite firearms as better killing tools than sharp implements, but there are several reasons why Katla dislikes using firearms as killing tools. One of these reasons is legal. The Dutch have strict gun control laws, maybe even the most severe in Europe. In the Netherlands, only law enforcement officers and army personnel are allowed to bear small firearms. Some occupations, like game warden, allow a restricted use of occupational firearms, like hunting rifles. That doesn’t mean that civilians aren’t allowed to use firearms, but their use is restricted to recreational or sports, and they are only allowed to transport the guns in a locked case, with the bullets separated from the gun. Same goes for other weapons, like martial arts practice weapons, that have to be transported in closed bags. Transport of a Japanese sword, for instance, is only allowed if the sageo (cord) secures the blade in the saya (scabbard) and the sheathed sword is carried in one or more bags, to prevent the bearer from quickly drawing the sword. A bokken, or wooden sword, has to be carried in a bag as well. About the only ‘clubs’ that can be carried without the need for concealment, are field hockey sticks. And canes, of course. Since there have been knife skirmishes where people became seriously hurt, the police will hold ‘preventive searches’ at mobile checkpoints, most often around subway stations, where everyone is scanned with a metal detector and has to empty their pockets. These checkpoints are prevalent at certain areas, mainly around Leidseplein, Rembrandtplein/Thorbeckeplein, Nieuwmarkt, Dam, where the mayor has put a law in effect that restricts possession of anything that can be used as a weapon, not just guns and knives, but also screwdrivers, chisels, chains, hammers, and other tools. Also, regular pocket knives, like the Victorinox ‘Swiss Army’ knife are also prohibited. So, while getting caught with a firearm is a felony and will get you arrested straight away, possession of a sharp implement will often only result in a fine and seizure of the forbidden implement. For someone skilled in handling blades, there is no real necessity to carry a machete or kukri blade. Several arteries that are fatal when severed are close enough to the skin to be reached by a blade no longer than the width of a hand. Especially the arteries in the crotch, armpit and neck are vulnerable to a knife attack. Katla’s assignment often take her up close and personal with her targets. As many professionals will acknowledge, killing someone at arms length is the most difficult and dangerous way to end someone’s life, but it's also extremely reliable. Any projectile weapon will be less accurate than a handheld blade in the assassin business. I know that's a controversial stance to take, and many owners and users of projectile weapons will rally the merits of their weapons, but professional assassins prefer a knife, a garotte or even a rumal* to a gun if they have to kill in close quarters. Combat/warfare weapons are for the battlefield, not the assassination game. Guns are suitable for shooting your way out of a room full of enemies and an AK-47 is awesome when clearing a building of enemy combatants, but professional assassins are often stealth killers and even a suppressed Ruger Mark II .22 semi-automatic pistol** will make more noise than a well-placed spike dagger. That's not to say that projectile weapons are unreliable or inaccurate—any sniper adhering to the 'one shot, one kill' principle will protest any such claim—but there are too many people surviving bullet wounds to validate my assertion. But, what about all the people who survive knife wounds? Of course there are plenty of people who get into altercations with someone wielding a knife and survive the encounter. However, in 99% of these cases, the knife wielder was not out to kill, whereas most people who fire a gun aim to kill. And fail. *Rumal, a silk cord with a coin tied to one end, used by the Thuggee cult of India to whip the cord around a neck and strangle someone. "more I read the more I want "
" Henry wrote: "I 100% agree with Martyn. Except I think you were over-generous giving it 1 star." What can I say? I'm a generous person. :D "
As the author, of course I cannot rate or review my own work. What I can do is give you, the potential reader, some background information about In Pocket. About twenty years ago, when I was working on what was to become Reprobate: A Katla Novel, I ha As the author, of course I cannot rate or review my own work. What I can do is give you, the potential reader, some background information about In Pocket. 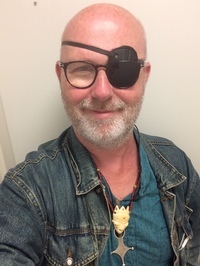 About twenty years ago, when I was working on what was to become Reprobate: A Katla Novel, I had a half-finished story on a busker who lived in a delivery van and pretended to be blind in order to rake in more money. As such, Wolfgang was the only one who saw a murder by assassin Katla Sieltjes, who promptly started hunting him down to shut him up. The story didn't work and I wrote a new story with Katla as the protagonist, who breaks her rule of never leaving a witness alive when blind busker Bram Merleyn enters her crime scene. Readers of the Amsterdam Assassin Series know what happened after that, so I'm not going to rehash that story. In the meantime, Wolfgang was still living in his van with his pet rat Gabriel, but he changed from busker to pickpocket, and acquired a heroin addiction (being one of my characters can be very taxing). I often write on several projects at the same time, and I kept adding to the story of Wolfgang the pickpocket until it reached critical mass, all the pieces fell together, and In Pocket almost wrote itself. In Pocket is a stand-alone novel, but it has some connections with the Amsterdam Assassin Series beyond the same locations - if you read carefully, you will find cameos from characters that also appear in the series. We’d love your help. Let us know what’s wrong with this preview of In Pocket by Martyn V. Halm.
" Well, you have to keep in mind that I write books filled with violence, murder, mayhem, and just a bit of romance. So I was constantly hoping a charac Well, you have to keep in mind that I write books filled with violence, murder, mayhem, and just a bit of romance. So I was constantly hoping a character would snap. My idea of a good wedding scene is the Red Wedding from A Song of Ice and Fire, with most of the guests dying in a bloody torment. So that disappointment influenced my opinion somewhat. :D ...more "
" I had a import bot add the 'Kindle' version of my book Ghosting, while it was already added as an e-book. Can they be merged? Gh I had a import bot add the 'Kindle' version of my book Ghosting, while it was already added as an e-book. Can they be merged? Ghosting - A Katla Novel ...more "
“Calvin: I used to hate writing assignments, but now I enjoy them. I realized that the purpose of writing is to inflate weak ideas, obscure poor reasoning, and inhibit clarity. With a little practice, writing can be an intimidating and impenetrable fog! Want to see my book report? I've been receiving feedback from beta-readers on the ROGUE manuscript. Many typos were caught and some scenes need to be rewritten, with other scenes ending up on the cutting room floor. It's great to feel so supported by people generously giving their time to helping me improve the next novel in the Amsterdam Assassin Series. Research can be fun. I'm currently smoking heaps of herb and listening to Bob Marley, Burning Spear, Steel Pulse, Black Uhuru, Yabby U, Lee 'Scratch' Perry, Yellowman, Peter Tosh, and Aswad, to adequately research the fourth novel in the Amsterdam Assassin Series, Ghosting. Beats watching an autopsy for Reprobate.